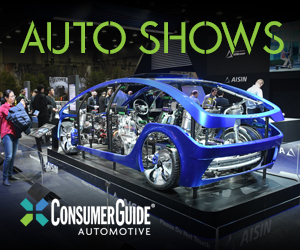 DETROIT—After a few rounds of concepts and lightly disguised show-vehicle versions, Kia officially took the wraps off its all-new three-row SUV at the 2019 North American International Auto Show in Detroit. 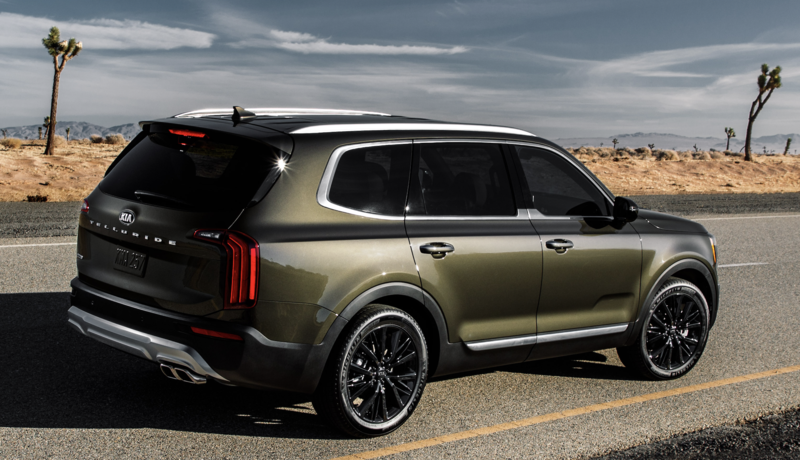 The 2020 Kia Telluride is the largest vehicle Kia has ever produced, and it has been designed specifically for the North American market. The Telluride can seat up to eight occupants and is powered by a 291-hp 3.8-liter V6 paired with an 8-speed automatic transmission. Front-wheel drive or all-wheel drive models will be available in LX, EX, S, and SX trim levels. The exterior styling combines a boxy, burly silhouette with sophisticated details, and the interior has an upscale feel, with simulated brushed-metal trim elements and matte-finished wood. 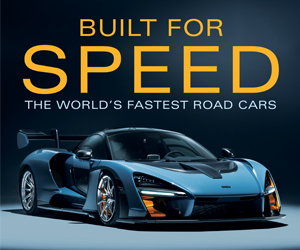 Available features include double-stitched quilted Nappa leather upholstery, heated and ventilated first- and second-row seats, and a heated steering wheel. A full roster of Kia Drive Wise driver-assistance systems will be available, including forward collision warning with automatic emergency braking and pedestrian detection, adaptive cruise control with stop & go capability, blind-spot collision avoidance assist, and rear cross-traffic collision avoidance assist. Those last two features are firsts for a Kia SUV, as are Lane Following Assist (which works with the adaptive cruise control system to keep the vehicle centered in its lane), Quiet Mode (which cuts audio in the second- and third-row seats so sleeping occupants aren’t disturbed), Driver Talk (which enables communication with the second- and third row through the audio system’s speakers), Safe Exit Assist (which can detect an object approaching from the rear and keep the child safety locks activated until the object passes), and a head-up display. Other available features include wireless device charging, multi-Bluetooth connectivity (two phones can be connected simultaneously), 10-speaker Harman/Kardan audio system, and six total USB charging ports—two in each row (five ports are standard). The Telluride will be produced in Kia’s KMMG manufacturing facility in West Point, Georgia, and is slated to go on sale later this year. Pricing will be announced closer to the launch date. The “plus-size” three-row midsize SUV market is full of activity these days. Existing contenders are being refreshed or redesigned, and Subaru and Volkswagen have recently jumped in with the Atlas and Ascent, respectively. Now Kia is rolling out the Telluride, and Hyundai should be following in the very near future with the Palisade. 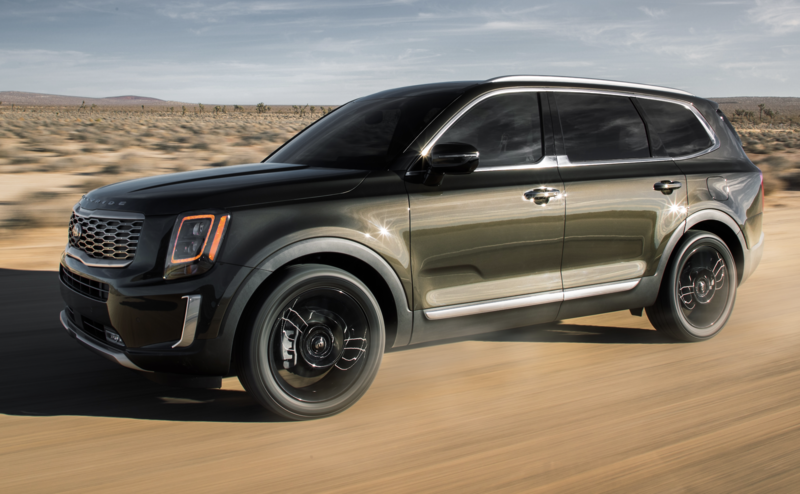 The Telluride seems poised for success, particularly if Kia comes in with competitive pricing—it’s got bold yet handsome styling; a spacious, nicely finished interior; and an everything-but-the-kitchen-sink list of available comfort, convenience, and safety features.